Go PINK for Breast Cancer Awareness! 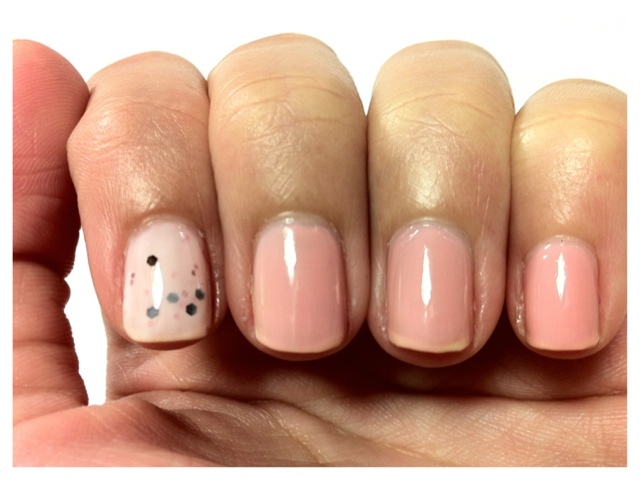 Just a quick post on the pink mani I did recently. By now I guess most of you out there know that October is Breast Cancer Awareness month among others. To show my support I have been wearing more pink manicure, something I am not overly fond off. Anyways, here’s my pink mani. 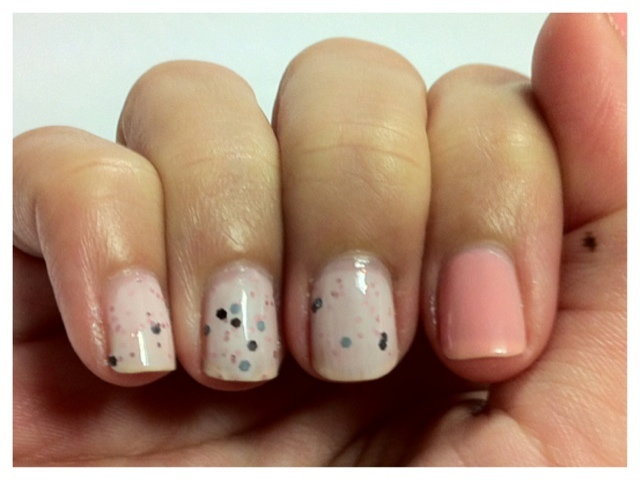 The polishes used here are OPI Second Honeymoon and The Hungry Asian’s I Hate Pink as an accent nail. 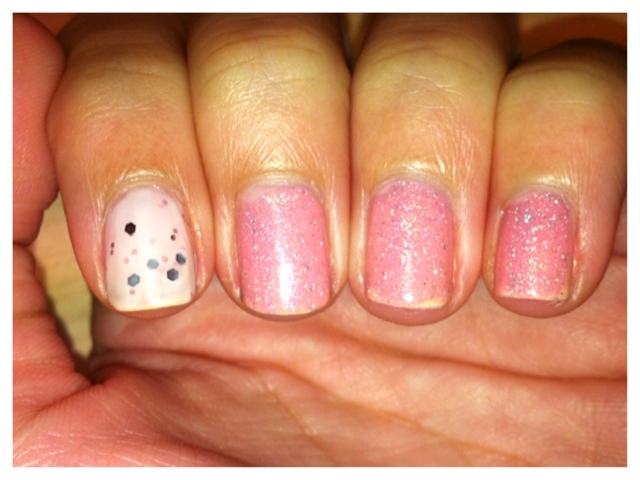 I did 3 coats for SH and topped my ring finger with 2 coats of IHP. I have an awesome polish for you today! It’s Belle by Kae from The Hungry Asian. Belle was made with Kae’s dog in mind. As a dog lover myself, I find this really sweet! 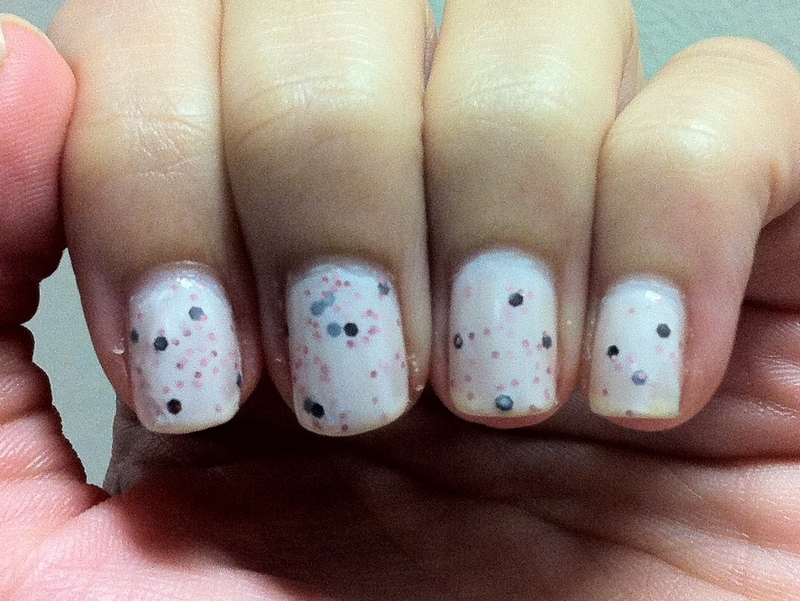 On to the polish, Belle is a sheer milky base with small pink hex glitter and medium brown hex glitter. I especially love the pink and brown combination. You seldom see that around! The last I used this polish was as accent nails in this manicure. Back than I layered it over a light pink polish but this time I am going with just 3 coats of Belle. As before, the glitters come out with no problem and it applies really smooth. Just your usual top coat routine should suffice. Belle might be a white based polish but surprisingly when I took some outdoor photo of this manicure it took on a pink hue; as if I painted it over pink! I love Kae’s creations and am thinking to get her newer colors – if I weren’t on a No-Buy! She does have a fall and Halloween line coming up soon!! It looks great from what I have seen on Fcaebook. 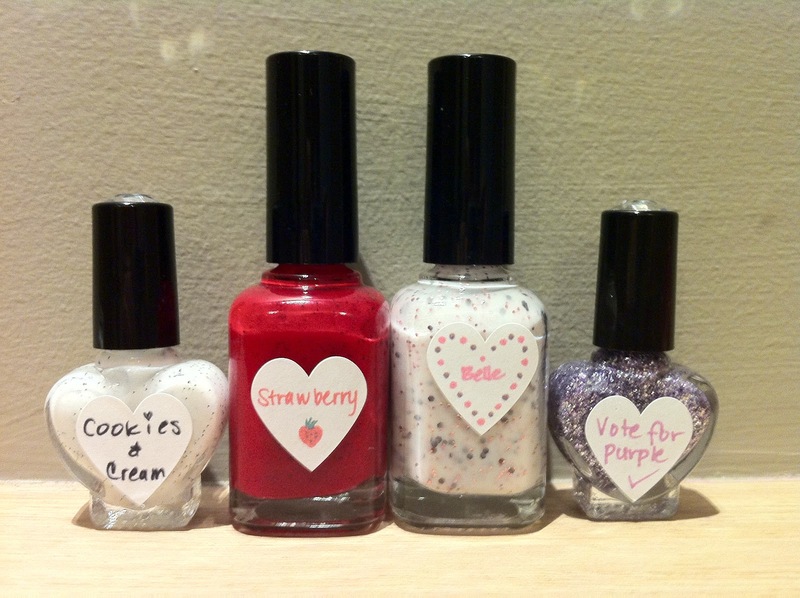 If you are interested to buy some polishes from Kae, do pop by her Etsy shop to grab them. Also, do follow her Facebook page for updates on her products. A little sneak peek of my newest purchase from The Hungry Asian! I used 2 coats of My Second Honeymoon from OPI for my middle, ring and pinky finger and layered 2 coats of Belle over one coat of MSH for my thumb and index finger. I love how Belle has a little pink tint to it in this little experiment of mine! And I did the opposite for my right hand! This photo has a different light to it as it was taken at different times of the day. (My bad! Sorry!) But belle stand out even more in this shot. 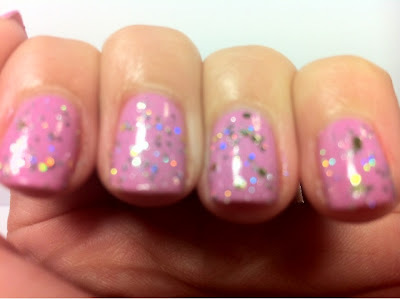 you can see the fine pink glitter much more here! I had to try on the Ozotic Holographis polishes I just got in the mail from piCture pOlish! 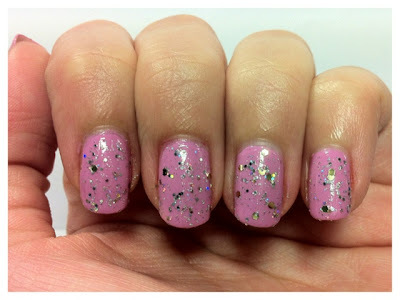 And since I was wearing pink from before I decided to just give my previous mani a little more ‘oomph’ with Ozotic 607. I used only 1 thin coat in the photo above and it has transformed my sweet little mani into something very party appropriate! No buy month of June sucked! I had to wait forever (read: 1.5weeks) before I aould allow myself to place an order with Kae again. Anyways, I always loved THA Strawberry from the moment I saw it long ago. But the problem was that it was out of stock for as long as I knew. 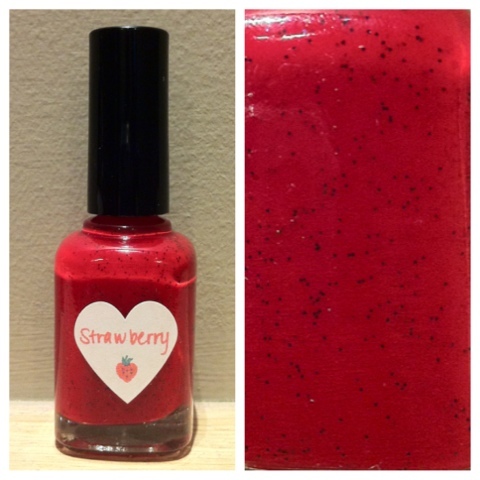 When Kae posted that she was going to restock Strawberry I was over the moon – for 5 seconds before I found out it was already sold out by the time i checked etsy AND I was still under a No-Buy I imposed on myself. Boo. Fast Forward 1.5 weeks and there I was placing an order on etsy with a full size Strawberry, a full sized Belle, a mini Cookies and Cream and a mini Vote for Purple. And after 2 more weeks of waiting, they are finally here! 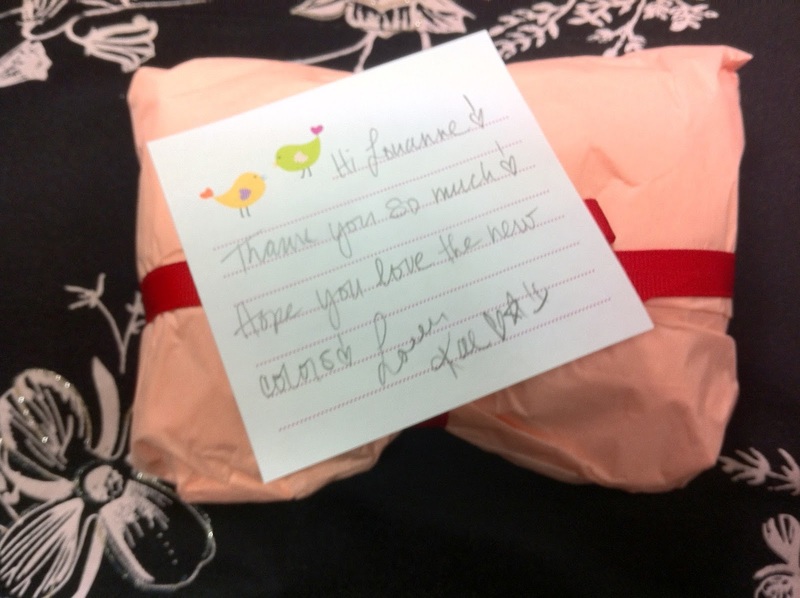 As usual Kae wraps up the polishes very neatly and nicely with a lovely personal note that comes in the package. My goodies all lined up! Vote for Purple is a lavender glitter bomb with small and medium silver glitter in it. This looks like a lavender equivalant to I Hate Pink to me. Strawberry!! 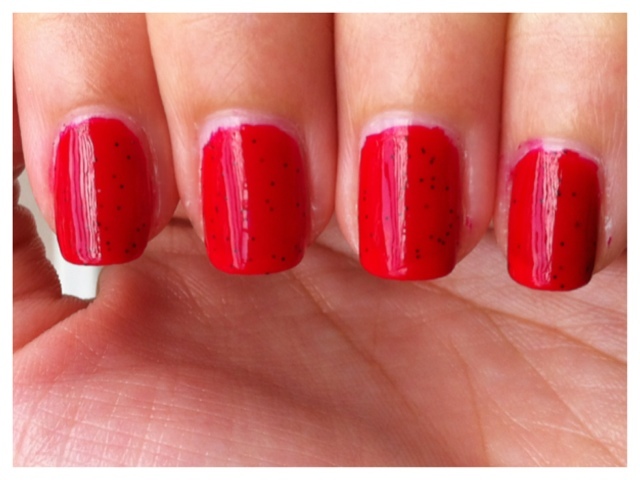 as the name states it is a red creme polish with black microglitter in it. Ahhh! I should have another go with strawberry nails soon! Belle is definitely one of my favorite of all polishes right now. This polish is named after Kae’s dog and is a sheer milky base packed with pink microglitter and dark brown hex glitters. As much as I love glitterbombs I definitely love glitters in white creamy bases (the reason why I got Election Day from Paris Sparkles). 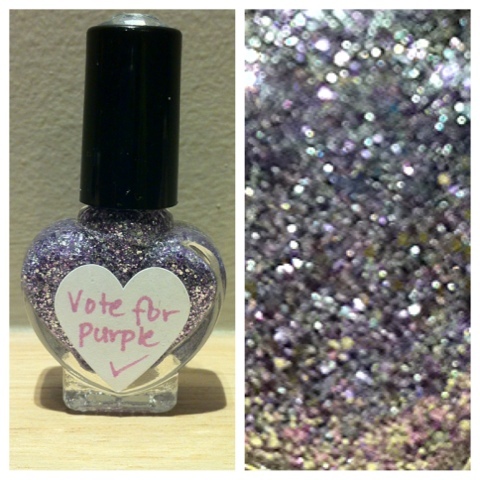 Judging from the bottle shot, I can definitely see this polish apply smoothly with no glitter issues! These Hungry Asian Polishes and much much more can be bought on Kae’s etsy shop. I finally found some me time today! Aside from doing a bunch of chores, I finally could sit down to do a swatch and review of Sea Creature which I got from Kae from the Hungry Asian. At first glance Sea Creature leans more to a darker shade of teal, almost black. I wanted to bring out the hidden blue tones in it so I decided to pair it with a nice bright blue polish – OPI No Room For The Blues – as the base. I swatched Sea Creature in increasing layers across my fingers to see how it would build up and it seems it does that quite well. But I did have to wait a minute or so between the layers to avoid too much tugging and sliding. The first coat of Sea Creature already sees a rather high glitter density and by the second coat I would say that the nail is almost 70% covered. 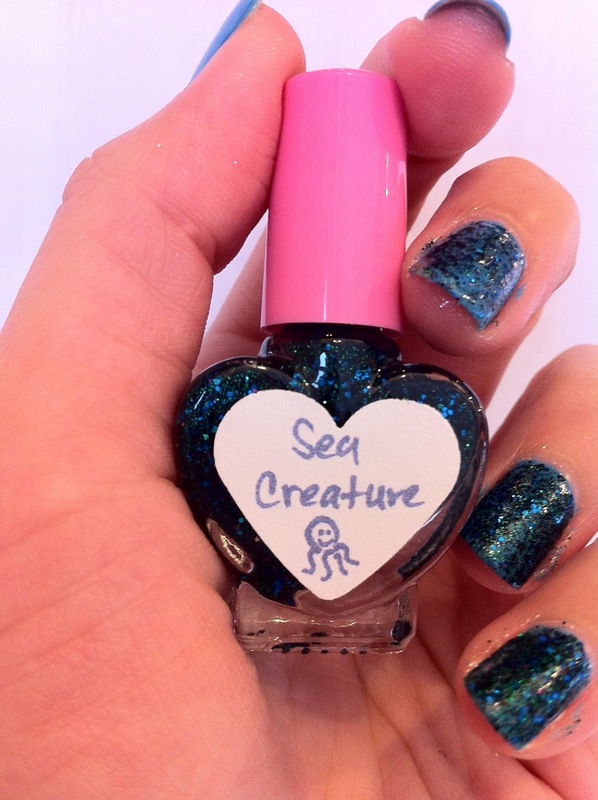 At 3 coats, Sea Creature is almost opaque with only bits of the base colour peeking through. And by the time the fourth coat it actually looks exactly like how it is in the bottle. I added 2 coats of top coat and wore this out for dinner, passing it as a ombre mani. I managed to get a shot with the evening sun! 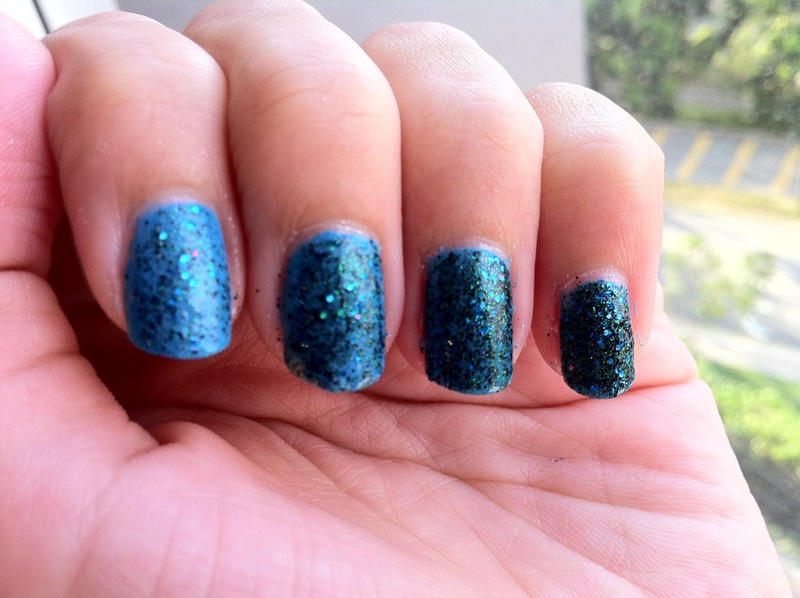 Looking back on the photos as I post them, I think Sea Creature may look better on darker polishes. Or at least you could get a good dark color with 3 coats instead of 4 like I did here. The Hungry Asian Polishes can be found on Etsy. Do follow her blog and her Facebook page for more updates!